Normally at this point of camp Foster is talking about how 'heads are tying up the feet' of the Hokies' inexperienced defenders. And perhaps that's still to come. However, I found it interesting Foster is pushing the gas with getting his young defense up to speed: http://www.dailypress.com/sports/dp-spt-vt-defense-youth-0814-story.html. "I said this to Coach Fuente and the staff, we're actually going to throw a little bit more at our guys on day one, earlier than we ever have," Foster said. "And I think that's a credit to the kids we have here. I think it goes back to the football IQ of some of these young freshmen. So we're going to throw a lot at them early and then kind of do it over and over and over again. So we're not going to slow down." Foster feels good about the defense's football IQ. That's a good thing. Make the big plays stop. Among Foster's least experienced defenses, the worst (2000) yielded 22.6 points per game, 45th nationally. Bud is a miracle worker, confirmed. Even for players-only summer workouts, the defense used blitz packages that Foster left in their lockers, the better to stress an offensive line that, with three returning starters, the coaches believe can be a team strength. Perhaps Foster is planning to bring even more heat this season. Meh, Bud is getting soft in his old age. Maybe the whole big-opening-game-to-keep-the-team-focused strategy is working? It's been said before that the learning curve and DT depth may be the only things that slow down what looks to be as talented of a defense as we have had in Blacksburg in a long time. This is very good to hear from the DC. youre not getting enough upvotes for your first sentence. We'll all have a better idea of exactly where this defense is in about 3 weeks. Until then, I'm trying to significantly limit my screen time and increase my spearfishing time in a futile attempt to make the days go by quicker. Do you happen to work for fedex and riding on a cargo flight across the pacific? Blitzing is always easier for a young defense. You go to a predetermined spot rather than being asked to read keys. I just worry about the corners being on islands. The WR/DB islands did not help Pitt's young DBs a few years ago. I also recall Deablo having himself a game being the center fielder against WVU and ODU before the injury. I think this is where we will excel in 3 weeks, putting on the pressure, and forcing the lob throws allowing our safety to pick off the pass. Great point. My concern is one or two young guys out of place, and the result is an 80 yard run. I wonder if this is something Nix has had good experience doing, something Bud is changing long term on his own, or a "we have to do something different because we are so young? I'm worried he's worried there will be too many busts, and is chucking up a hail mary to see if the defense can catch it. Pressure from the front 7 is going to make the back 4 look that much better. It will be interesting to see more zone-blitz schemes this year as well considering safety is a position of experience and the DEs are athletic enough to drop. I think the player(s) I am most excited about watching on defense this year are Hunter and Floyd - I think both of those guys have 'game changing' ability. Was scanning through the Reggie Floyd mic'ed up videos and it looked like Dax was at Backer again with the 1st team linebackers and secondary (paired with what appeared to be the 2nd team DL). Ashby at Mike. 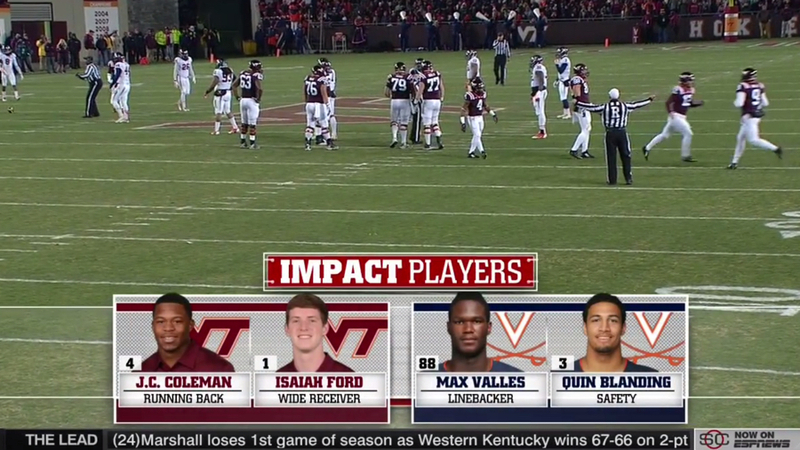 Dax as 1st string Backer seems like a real thing. If that is true, where does that leave Rivers? EDIT: Nevermind. Looks like Rivers at backer in at least one part of the clip.